Driving whilst impaired through alcohol is now almost universally regarded as anti-social. Long gone are the days when it was acceptable to drive to the pub, down a skin full and then drive home again. The first blood alcohol limit for drivers was introduced in January 1966 and the limit was set, in England and Wales, at 80 milligrammes of alcohol per 100 millilitres of blood (equivalent to 35 microgrammes per 100 millilitres of breath), that same limit remains today. Scotland reduced the limit in 2014 to 50 milligrammes of alcohol per 100 millilitres of blood (equivalent to 22 microgrammes per 100 millilitres of breath). Although numerous campaigns reduced the number of drink driving casualties the previous steady decline has changed to an increase in recent years with statistics showing a large rise due to “morning after” driving offences. So, whilst I'd hope all of you leave the car at home if drinking, many of you may have inadvertently driven whilst over the limit the morning afterwards. And that's where I see alcohol breathalysers devices such as those manufactured by AlcoSense come into play. 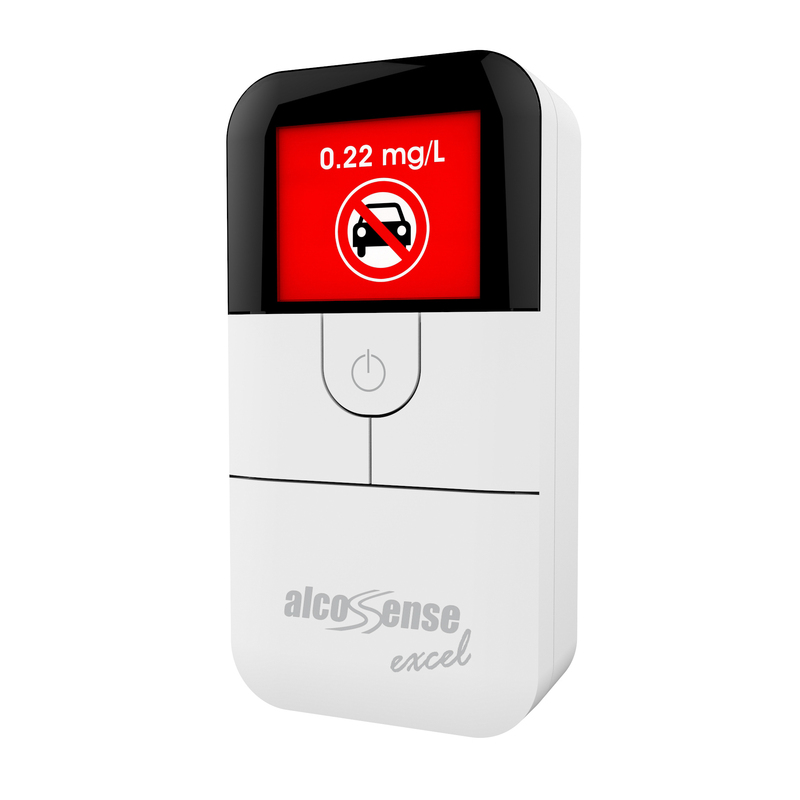 AlcoSense have a range of devices but I have been testing their mid-range Excel, a £99.99 battery powered unit that claims an accuracy of +0.15% BAC, -0.00% BAC. 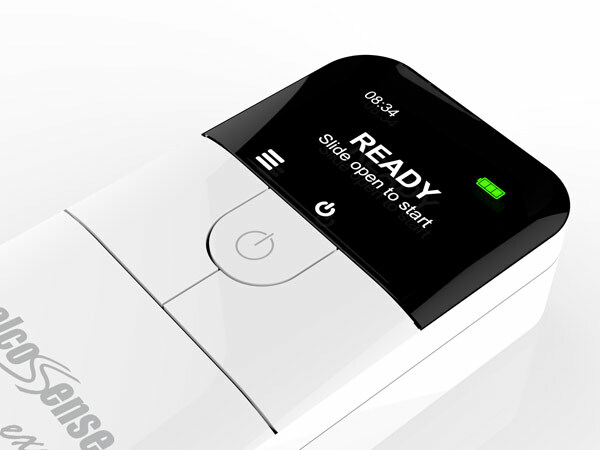 Pop in the batteries, press the power button and the unit will start-up in setup mode. Cycle through volume and brightness settings and then input the blood alcohol limit for your region. As I'm in England that's 0.80%. Because Scotland has a lower limit the Excel helpfully defaults to 0.50% as a safety precaution. The user guide has a table of limits for other countries should you need to adjust the limit whilst travelling abroad. Then set date and time and you're ready to test. 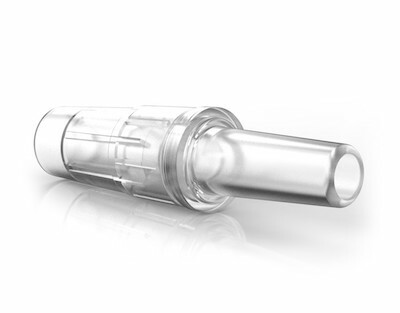 Slide open the unit, insert a blow tube into its receptacle and then start to blow. The display guides you through the process, advising you to blow steadily and indicating if you are not blowing hard enough or do not blow for long enough. Once sufficient breath has been sampled it beeps and a few seconds later the reading is displayed. 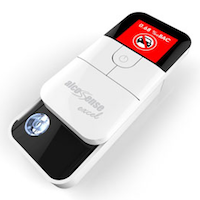 AlcoSense use a traffic light type system, a green display is a pass with Trace or No alcohol detected , < 0.09 mg/L equivalent to 0.20% BAC, Amber indicates alcohol present and Red, complete with a 'DO NOT DRIVE' sign, indicates you are close to or over the drink drive limit. It's as simple as that. It's important to understand that the unit errs on the side of caution so over-reads by 20% to ensure safety and minimise any risk of under-reading prior to the re-calibration that is required every 12months. 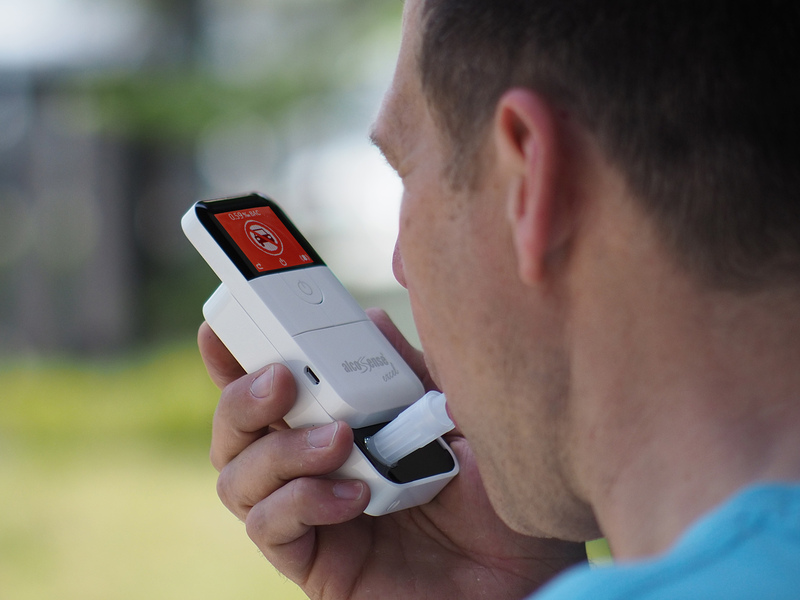 Also, in common with every other portable breathalyser, you should wait at least 10 minutes after consuming your last drink to ensure any mouth alcohol has evaporated and to allow 3 minutes between tests to allow the sensor to purge the last test. I had a brief opportunity to test the AlcoSense Excel against a Lion alcometer 500, a unit currently in use with UK Police. Whilst not a scientific test by any means, it did allow me to verify the accuracy of the Excel. I had two volunteers imbibe for the test. Subject 1 consumed a 250ml glass of white wine, the other five pints of lager. 15 minutes after the last drink I ran the test. So the AlcoSense was consistent and over-read in both tests when compared to the calibrated alcometer. That's quite impressive because, although this uses the same sensor technology as the Home Office approved devices that Police use, the sensor it uses is much smaller. AlcoSense state it's sensor is a 64mm² Fuel Cell compared to 200mm² sensors typical of police units (Lion do not specifically state what sensor size they employ). In the few weeks I've had the unit I've had no issues with testing, the unit has consistently produced a reading that matches what I expected given the drinks consumed. It's compact, easy to use and reliable. I do wish they could incorporate storage for a couple of blow tubes, something that it lacks currently, but that's a minor gripe. In common with all breathalysers this unit does require recalibration every 12 months to ensure accuracy, AlcoSense charge £19.99 for this service. 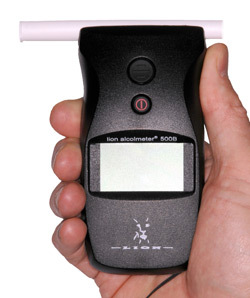 If you're in the market for a breathalyser then you can't go wrong with this one. So while they claim +15%, it was actually 25% higher than the 'official' one for the lager and 30% higher for the wine. But at least it's erring on the 'safe' side. I don't think it would be fair to focus too much on the amount of over-read here. These were far from laboratory conditions and time was against us. But they did confirm the unit's reading was consistent against the alcometer and that it over-read. I'm old enough to have initially been trained to use the glass tube and bag breath testers, remember those? Open the box, use the seated edge to cut off both ends of the sealed tube and then pop a mouthpiece and bag. All they had was a line on the tube, the crystals inside changing colour in the presence of alcohol and if the colour passed the line then that was enough for a trip to the nick. I wonder how they would measure up for accuracy nowadays? I very much doubt this is a design flaw and is probably done intentionally - a bit like the cooking instructions on anything you buy in the shops basically encouraging you to 'nuke' it for fear of the producer/shop being sued for causing food poisoning. In my experience the rise in 'morning after' breath test failures has a lot to do with immigration - but it would be interesting to do some freedom of info act research to see how the various nationalities (recorded on custody records) relate to this subject. They state in the guide that this unit has a +20%/ -0% error built -in to provide an extra level of safety and to compensate for errors that may occur as the unit nears the 12mths re-calibration period. Huh? How does that have any bearing on this?? The rise is due to people consuming greater quantities of alcohol and drinking later into the evening/early morning. If it takes one hour to break down one unit of alcohol it's not hard to see how you could easily have consumed too much to be clear by 7 or 8am the following morning. They state +20% in the manual. The test was near 25% but that difference could easily be down to my testing method. Its not immigration pushing up the figures, its women aged between 45 - 60 and young men 25 - 30 who are the main culprits. The whole article was about the problems of morning after driving, yet the tests were carried out 15 minutes after drinking. How about seeing how it well it copes compared to the police unit in a proper morning after test? Surely you could have found a couple of volunteers to drink a sufficient amount to be at risk? And why is that relevant? I mention the morning after issue as a reason why testing might be valuable. I've compared the AlcoSense to an alcometer to show it is broadly accurate. So why would having someone run tests the morning after demonstrate that this is any more effective at measuring BAC? Finding volunteers to drink isn't the issue, getting access to an alcometer is and so I ran the tests that I could when I had the all to brief chance to use one.